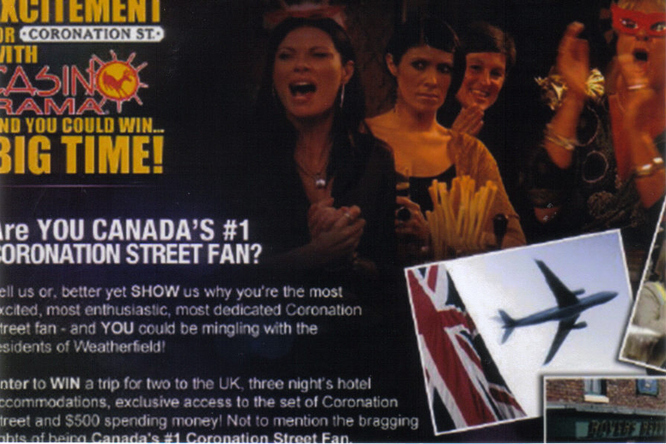 In June 2009 we were watching Coronation Street and a commercial came on 'Are you Canada's # 1 Coronation Street fan, would you like to win a trip to England home of Coronation Street?' I replied YES to both and after the show I immediately headed over to the CBC website to see what was involved. This was a contest I wanted to win. Along with 1000's of other fans, I knew I had to enter. In up to 1000 characters they wanted to know why I was the # 1 fan, plus I could add a photo. They were looking for creativity, passion and history with the show. On July 7th we picked up four of my favourite English relatives at the airport. We picked up some dinner on the way home and took it back to the house where my sister and family joined us. After dinner it seemed like a 'lucky' day and time and I entered my entry online - the 7th day of the 7th month about 7pm. After clicking send all 11 of us cheered. The winner would be announced the week of July 26th, which was my birthday.....the year before I'd been very luck on my birthday, would this year be lucky as well?? My winning entry is below along with the photo I entered with it. On July 29th my relatives returned to England and we all figured I hadn't won. The following day at 4:51pm there was a message on the answering machine I'll never forget. It was Bryan from CBC saying I had won the contest.....'this is not a joke or a friend playing a trick, you really are our winner'. YAHOOOOOOOOOOOOOOOOOOO!!!! My prize was a trip for two to Manchester, 6 nights at the Marriott, spending money, a tour of the studios and bragging rights as the number one fan. In March 2010 my husband Al and I took our winning trip and what an amazing two weeks it was! A week was spent in Manchester and another week was spent with my relatives. It is two weeks I will never forget. THANKYOU to CBC and Casino Rama for having this contest with the most amazing prize. We had the best trip ever! To read all about the trip and see photos click ﻿here﻿.